Welcome Spring! Or at least I would love to be welcoming spring right about now. According to Punxsutawney we still have some winter left, but here in Indiana, winter was pretty mild, and the spring weather has been around for awhile. I got around last week to weeding the strawberry bed, and was pleasantly surprised to see that they had spread and continued growing throughout the winter months. My small little garden bed inspired me to create these Strawberry Blossom Puffs to bring in the official first day of spring. Now I love winter, but I also love the changing seasons. Going from that bitter cold, beautifully white covered earth, to temperatures just right and colorful blossoms popping up from the ground. There couldn’t be a better time to celebrate. Just a couple weeks ago Rosalina convinced me to have a picnic with the kids. 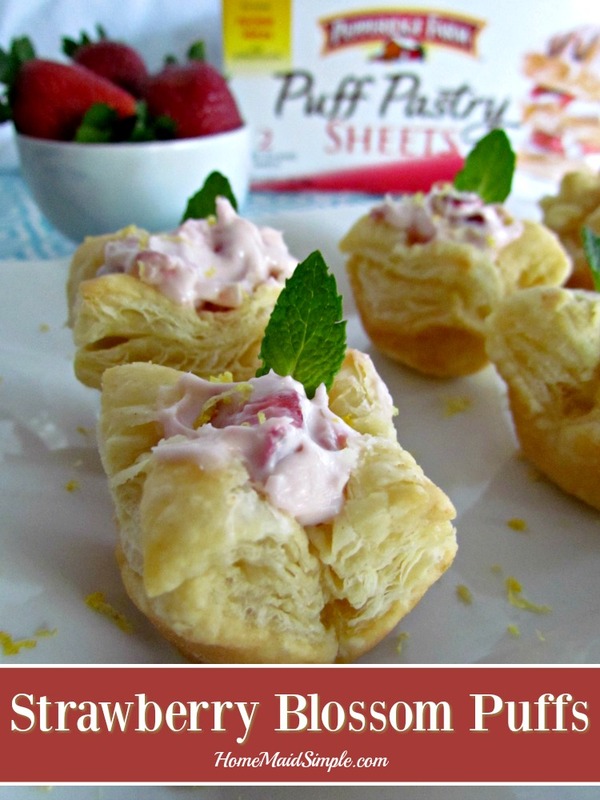 These Strawberry Blossom Puffs are easy to make with Pepperidge Farm® Puff Pastry. 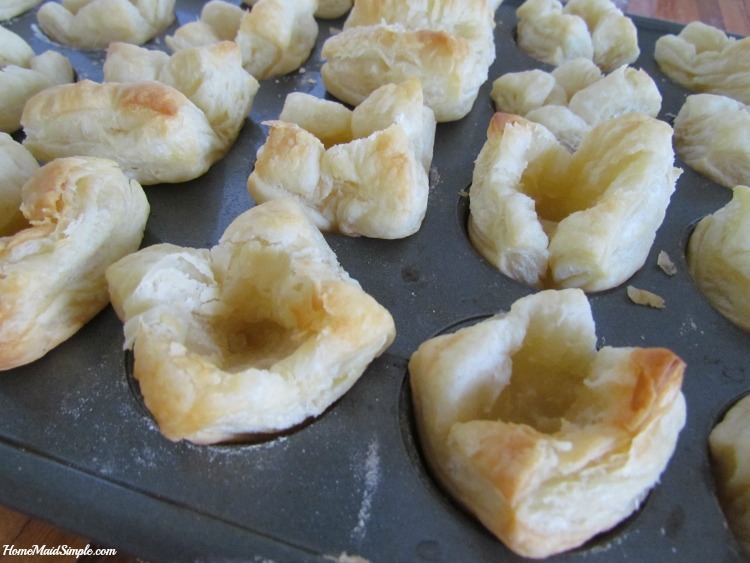 I use to be scared of the Puff Pastry, thinking they were too difficult to make right. They really aren’t hard to use at all, though! The dough starts out frozen, but if you follow the steps on the packaging for thawing, you will not struggle at all. In fact, they even have tips right on the box in case you forgot you pulled it out and let it thaw too long, or have other issues with the dough. 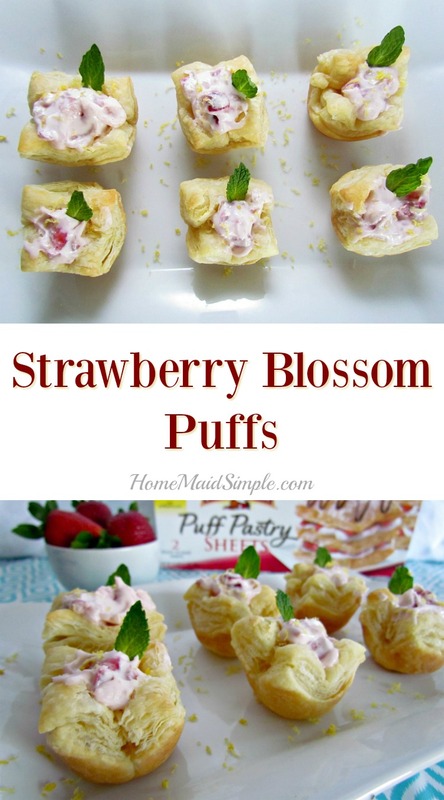 Alright, so I chose to use the Puff Pastry in these Strawberry Blossom Puffs, because to me Spring is a time for foods that are light and airy. The layers of dough from the pastry create that light airy texture, and mixed with the creamy strawberry filling, a beautifully textured spring recipe is formed. I used the full package to make my little blossoms, cutting both puff pastry sheets into 16 equal squares. You can also cut them into circles for a more even look around the edges. When the Puff Pastry first comes out of the oven, they will have completely filled the mini muffin tin. While they are still warm, use the back of a spoon to gently press the center down, effectively creating a well for your filling. Now I used strawberries in mine because that is my favorite berry of all time, but you could mix in any berry and get the same results. I think next we’ll try some blackberries. Can I tell you all a secret? I sent a picture right after I made these to Mark because I was so excited how they turned out, and his response was “Did you take the picture?” He thought for sure it looked too good to have been both made and photographed by me! I kid you not, that is how easy Puff Pastry’s make it to have Pinterest worthy food at your next party. If I can do it, anyone can do it! Celebrate spring with this light and airy treat. 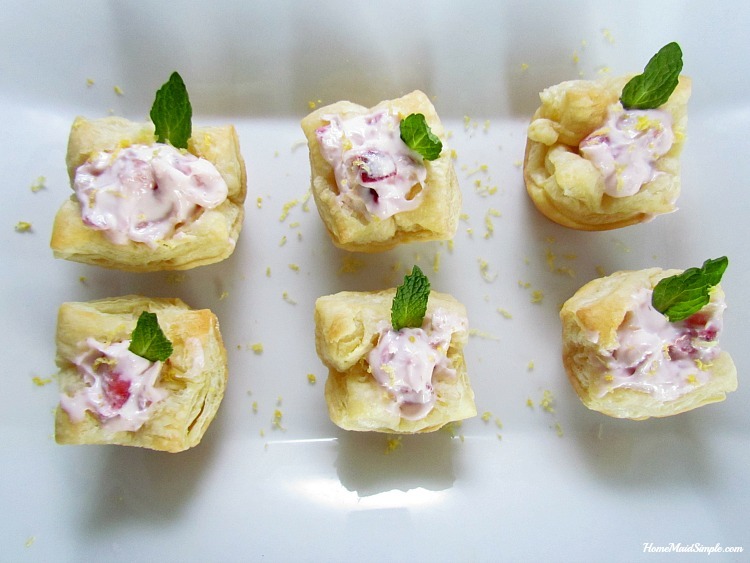 Whipped cream cheese and strawberries fill the perfect puff pastry's. 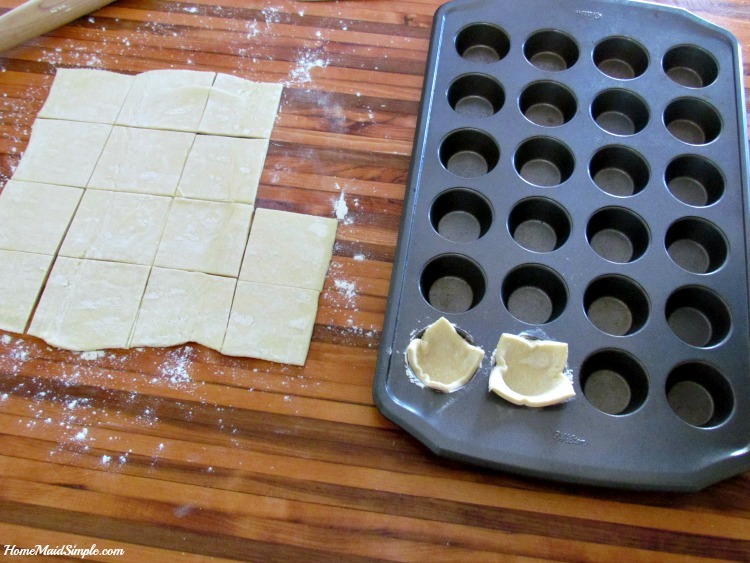 Unroll the Puff Pastry Sheets, and cut into 16 equal squares. Gently press each square into a mini muffin cup. Bake for 10 minutes. Gently press the back of a spoon in the middle of each puff to create a well. Let the puffs cool in the pan for 10 minutes. Remove to a wire rack. Mix together cream cheese, strawberries, lemon extract, and powdered sugar until well combined. Fill the Pastry Puffs with the berry mix. Sprinkle lemon zest over the tarts, and top with a mint leaf. I am drooling looking at those. They are so delicious!! !